MUG—ad-free and reader-supported—needs you! We need your help to meet our $50,000 operating budget for 2014. To date, we've raised $40,485. If you haven't had a chance yet this year to do so, please support MUG in any amount! Every donation, large or small, will help keep the lights on at MUG. Parks Perambulation—a biking meander to the parks of northern Manhattan this Sunday, 11:45am, 12 miles. 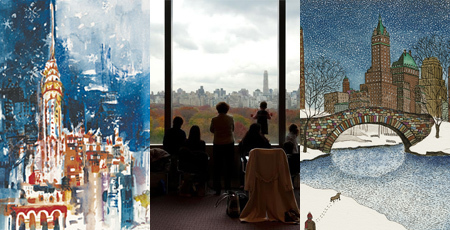 The Citymeals-on-Wheels Holiday Cards this year are beauties by Anne Watkins and Vartouhi Pinkston. You Don't Have 2 Settle charts the best dance parties in Brooklyn. Columbus Circle, Joe Holmes' gorgeous limited-edition print in the 20X200 series. If you want Broadway to carol you, you can't do better than Kelli O'Hara and Matthew Morrison at Carnegie Hall on December 19 and 20. Indagare Travel's 2014 Holiday Souk takes place in the Madeline Weinrib Showroom, 126 5th [17th/18th], Tuesday 12/2, 10-8 and Wednesday 12/3, 10-6. Michael Storrings, Creative Director at St.Martin's Press, designs book covers for his day job but moonlights in NYC-themed Christmas ornaments; meet him at these personal appearances. The only thing predictable from Canadian singer-songwriter Jane Siberry is the unpredicatble, viz. : Holiday Hoes & Hosers at Iridium, December 16-21.
sat 7am until sun 1am: all-day bach organ marathon: organists from the juilliard school perform 150+ fugues, chorales and other works over 18 hours. at saint peter's church in midtown. ticket prices: $10 75-minute slots, $40 half day, $75 full day. sat-sun 10am-6pm: the massive pier antiques show features 400+ exhibitors selling furniture, jewelry, art, fashion, more. plus, free appraisals sunday 10am-3pm (one item limit). pier 94, $20 admission includes both days. sat 10am-6pm, sun 10am-5pm: save 50% or more on thousands of books, cds and dvds at the 28th annual goddard riverside community center book fair. 593 columbus ave @ 88th st.
sat 11am-5pm, sun 11am-3pm: the annual danish christmas fair returns to brooklyn heights danish seamen's church (sat-sun, 102 willow st) and plymouth church (sun, 75 hicks st) with gifts, decorations, food and glögg. sat 12-6pm, 11am-6pm sun: the second annual american fine craft show at the brooklyn museum features handmade ceramics, jewelry, glass, furniture, wood, metal, mixed media, sculpture, and wearable + decorative fiber by 90 craft artists. $12 general, $11 seniors, $6 students. sat 2-5pm: get your fill of momo dumplings at the third annual jackson heights momo crawl. three bills of any denomination gets you a map of 18-20 food spots, eats go for $1 each. sat-sun 5pm: carnegie hall sponsors two free neighborhood concerts this weekend: opera singer sidney outlaw + pianist howard watkins at st. michael's church in the uws (sat) and ensemble acjw at our saviour's atonement lutheran church in washington heights (sun). thru 1/4: the morgan library + museum presents an exhibition of original and rarely seen handmade holiday cards created by major twentieth-century artists from the smithsonian's archives of american art. free fridays 7-9pm (reg. $18 general, $12 students/seniors).